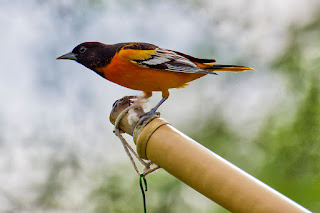 The Baltimore Orioles have been back and visiting the Grape Jelly feeder quite a lot. There are at least 4 males and 2 females. Hard to tell exactly because I don't see them all at one time. I captured this male on the pole for the Hummingbird feeder and I liked the bokeh behind him.